Elevator bolts have a distinctive wide, thin, flat, countersunk head with a square neck used to hold the bolt in place. They are most commonly used in recreational vehicle flooring, bucket lifts, conveyor systems and applications where a smooth surface is desired after the bolt have been inserted. The length of an elevator bolt is measured from the top of the head to the end of the bolt. Minimum thread length is equal to twice the bolt diameter plus 1/4 inch. 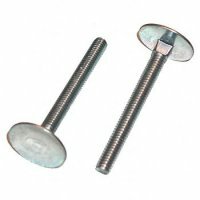 NutsandBolts.com sells steel (coarse thread) elevator bolts with zinc plating.